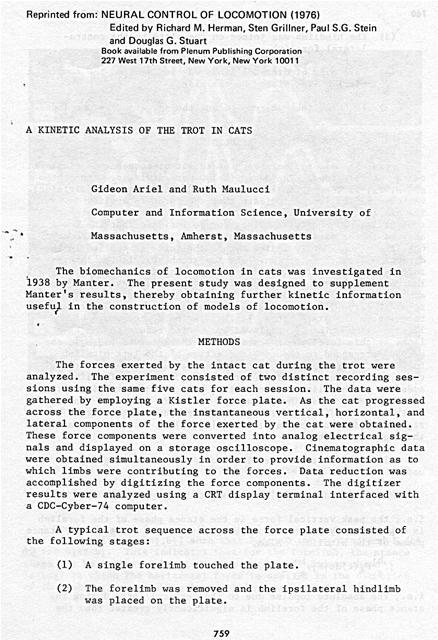 The biomechanics of locomotion in cats was investigated in 1938 by Manter. 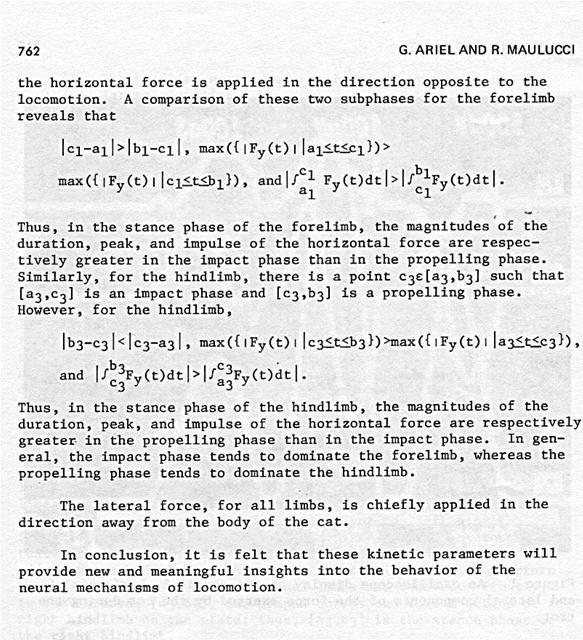 The present study was designed to supplement Manter's results, thereby obtaining further kinetic information useful in the construction of models of locomotion. The forces exerted by the intact cat during the trot were analyzed. The experiment consisted of two distinct recording sessions using the same five cats for each session. 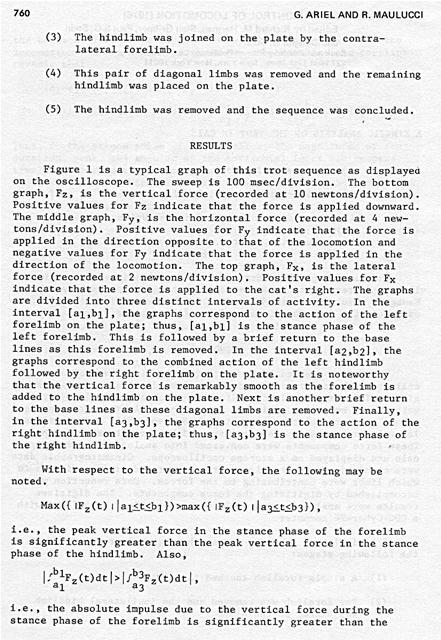 The data were gathered by employing a Kistler force plate. As the cat progressed across the force plate, the instantaneous vertical, horizontal, and lateral components of the force exerted by the cat were obtained. These force components were converted into analog electrical signals and displayed on a storage oscilloscope. Cinematographic data were obtained simultaneously in order to provide information as to which limbs were contributing to the forces. Data reduction was accomplished by digitizing the force components. The digitizer results were analyzed using a CRT display terminal interfaced with a CDC-Cyber-74 computer. (1) A single forelimb touched the plate. (2) The forelimb was removed and the ipsilateral hindlimb was placed on the plate. (3) The hindlimb was joined on the plate by the contralateral forelimb. (4) This pair of diagonal limbs was removed and the remaining hindlimb was placed on the plate. in the interval [a3,b3], the graphs correspond to the action of the right hindlimb on the plate; thus, [a3,b3] is the stance phase of the right hindlimb. With respect to the vertical force, the following may be noted. Figure 1. 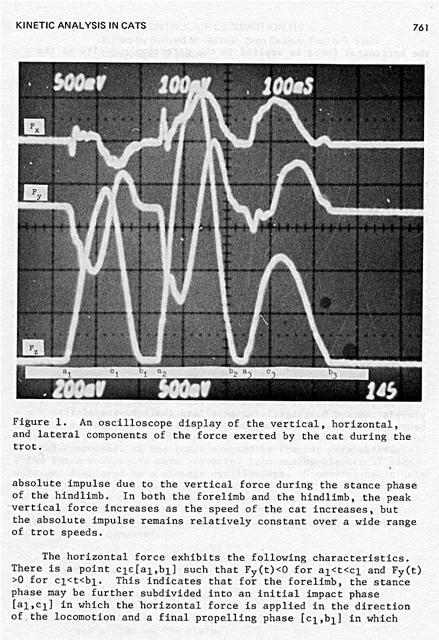 An oscilloscope display of the vertical, horizontal, and lateral components of the force exerted by the cat during the trot. absolute impulse due to the vertical force during the stance phase of the hindlimb. In both the forelimb and the hindlimb, the peak vertical force increases as the speed of the cat increases, but the absolute impulse remains relatively constant over a wide range of trot speeds. Thus, in the stance phase of the hindlimb, the magnitudes of the duration, peak, and impulse of the horizontal force are respectively greater in the propelling phase than in the impact phase. In general, the impact phase tends to dominate the forelimb, whereas the propelling phase tends to dominate the hindlimb. The lateral force, for all limbs, is chiefly applied in the direction away from the body of the cat. In conclusion, it is felt that these kinetic parameters will provide new and meaningful insights into the behavior of the neural mechanisms of locomotion. Generated on 4/25/2019 12:45:45 AM (PST) ADI/HQ/GBA/2019/ARIELCLOUD/v3.0.2018.0126.